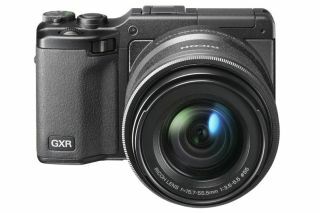 Ricoh is launching a new camera unit for its GXR interchangeable unit camera system. The RICOH LENS A16 24-85mm F3.5-5.5 is the fifth camera unit for the GXR system. The new 24-85mm unit brings together a newly developed standard zoom lens with a 16.2-megapixel APS-C CMOS sensor. This is the first GXR unit to offer a resolution of 16MP and an APS-C sized sensor. The lens offers a similar focal range to a typical kit lens. It features 11 elements in nine groups, plus a nine-bladed aperture for smooth bokeh (out of focus areas). The lens also features a new lens cap that opens and closes automatically as the lens is operated. New functionality is brought to the GXR body via the unit, too. A focus-assist option enables more accurate manual focusing, while five new creative scene modes are added. ISO bracketing, customisable picture settings and 1280x720 HD movie shooting are also included. Launched in December 2009, the GXR system occupies a unique position in the digital camera market. Instead of just changing lenses to suit the subject you're photographing, you change the imaging sensor as well. Lens, sensor and image processing engine are integrated into a single GXR camera unit which slide-mounts onto the front of the GXR camera body. This has many advantages, such as being able to match a smaller sensor with a telephoto lens for frame-filling images of distant subjects. Fast wide-angle lenses combined with large sensors would be more suited to low-light photography. The RICOH LENS A16 34-85mm F3.5-5.5 UK price is £449.99. A kit featuring the GXR body and the new lens will also be available for £599.99.